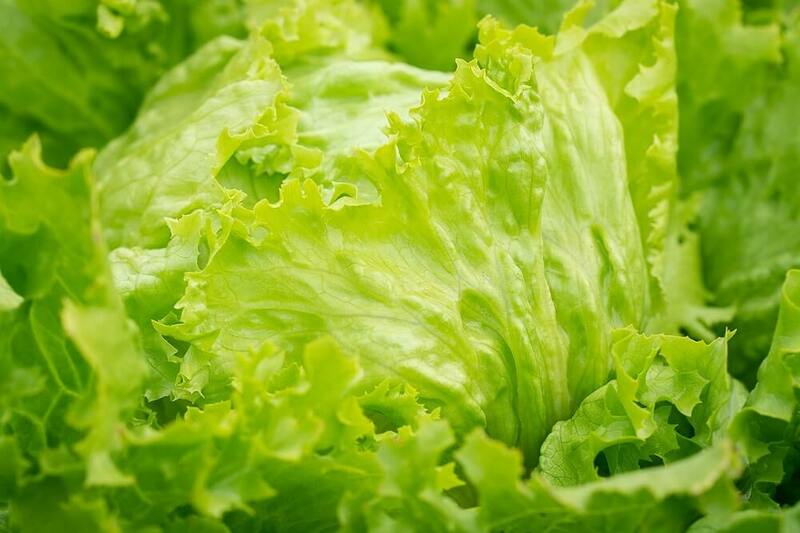 Iceberg lettuce, while not as popular as Romaine lettuce because of its lower nutrient content, is a popular ingredient in many salads. It goes perfectly with many other salad ingredients without overpowering them. It also adds a nice fresh and crisp texture to the salad. Chopping iceberg lettuce for a salad is pretty easy. With a sharp knife and a good quality non-slip chopping board, it should take no more than 5 minutes. Even if the lettuce was wrapped when you bought it, it is still a good idea to wash it. Remove the first two layers of leaves and discard them. They are the dirtiest and will usually have started wilting. Then wash the lettuce under running tap water. First remove the core of the lettuce. You just want the leaves. To remove it, estimate an inch from the bottom of the lettuce head and cut it at that point. Discard the cut part. This leaves you with just the crispy leaves. An alternative to cutting off the core is to hit the bottom of the lettuce against the countertop. You’ll have to use quite a bit of force to make sure the core breaks on the inside. After it breaks, you can easily pull it out with your fingers. But that’s an inconvenient method and may bruise the delicate lettuce leaves. Cutting with a knife usually gets the job done well enough. Note: I highly recommend using a sharp knife to cut and chop the lettuce. It will be faster, easier and produce better results. It is also safer as it gives you more control when cutting. If your knife has gone a few days without sharpening, quickly re-hone it using a sharpening steel or electric knife sharpener if you have one. If you are preparing your salad with large wedges rather than finely chopped lettuce, you just need to cut the head into four quarters. First cut the head in half then place both halves flat side down and cut each of them in half again. If the lettuce head was particularly big and the quarters are still too large, cut them again in half to get 1/8 wedges. If you want the lettuce well mixed with the other ingredient, you’ll need to chop it into strips. Decide whether you want large pieces or finely chopped ones. Whichever your choice, start by cutting the lettuce head in half. Then place one half on its flat side and hold it down with your non-cutting hand. Start chopping the lettuce from one end. If you want large pieces, simply chop the half lettuce head into 1/2 inch wedges. The strips will separate easily once you have cut the wedges. If you are going for finely chopped stripes, chop the lettuce as close to the edge as possible. It will take some time before you chop the full half. Remember to use a sharp knife especially when you are chopping fine strips. You’ll find it so much easier and faster. Here’s a quick video showing how to do it. Note that this method results in long thin strips. If you want shorter strips, cut the lettuce into four quarters. Then hold each quarter in the board and chop along the shorter side. The strips will be much shorter. You can make them as thin or as wide as you want depending on your salad preferences. Here’s another short video showing how you can chop shorter strips/wedges. Before you add the lettuce to your salad, make sure the slices are separated into individual strips. It’s much easier to do this before you mix the lettuce with the other ingredients. An easy way to separate the strips is to toss them with your hands. You can also use salad tongs.